2000AD Comic Prog #497 (22nd November 1986) | 'TAIN'T THE MEAT… IT'S THE HUMANITY! 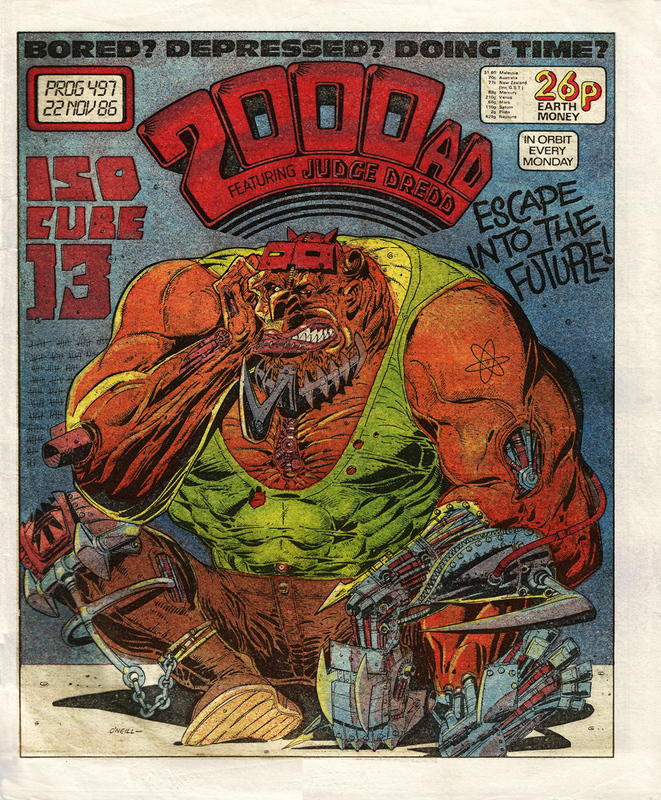 Cover dated 22nd November 1986 this cover to 2000AD comic featured a classic O’Neill character – a bloated, machine augmented monster who you strangely feel sympathy for. There’s no explanation to the identity of the poor slob, we just know that he’s in an Iso Cube and therefore must be a wrong ‘un. As strong as O’Neill’s image is though it bears no resemblance to the issue’s contents and appears to be a filler cover. Hardly surprising though as this wasn’t a particularly strong issue of 2000AD, with none of the strips really deserving the coveted cover treatment. Rogue Trooper kicked off Prog #497, followed by Slaine. A slightly surreal Judge Dredd story occupied the colour centre-spread, with comedy strip Ace Trucking Co. following. Finally Strontium Dog rounded off a pretty bland Prog. It wasn’t a terrible issue, but is wasn’t that much cop either. I’ve already looked at some of the other covers O’Neill contributed to 2000AD comic – click here to see them.